I couldn't resist - again! My sequel-ideas from Don and the Puzzle Box are very focused on Mikey and I think it could be a very emotional trip for him; to finally walk out in the open, to watch his brother have a wonderful and lovely relationship and to realize that he has the possibility to find a partner (maybe?). 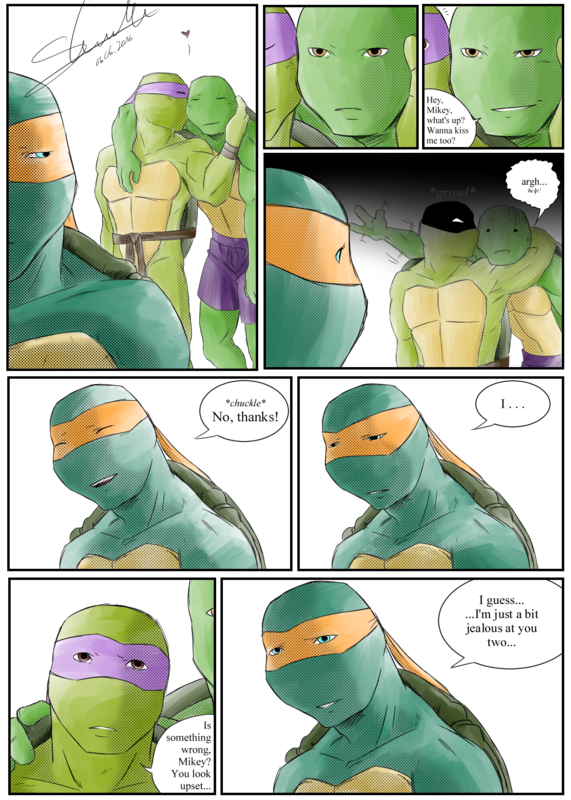 I think Mikey and Don have a special relationship as brothers (like Leo and Raph) so I decided that he's talking to Don honestly what he feels. Possessive Donnie is best Donnie. I like it- I sometimes think about stuff like that too- the jealous Donny and a playful Nicco- I once had a dream where it was one of those scenarios where the turtles are in a situation where they are faced with their multiple counterparts from all the alternate dimensions, and I imagine Donny asking Nicco if it is weird for him to see all the many different versions of Donatello- and Nicco being Nicco just smirks and says "Not at all, I've always wanted my own harem"... which of course results in him getting ninja nerve pinched by an irritated Donny until Nicco says he was only kidding and asks for mercy. Really love the choke hold Donny uses to tell Nicco in an oh so subtle way that he doesn't find his flirting antics amusing.